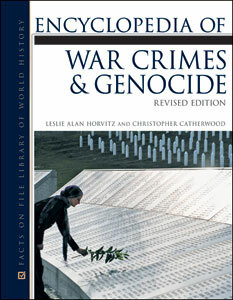 Encyclopedia of War Crimes and Genocide, Revised Edition examines the contemporary history of crimes against humanity, during both wartime and peacetime. With more than 500 entries, this two-volume A-to-Z encyclopedia covers a wide range of relevant topics, including human rights, war criminals, war crimes, examples of genocide, international organizations and international law concerning war crimes, and much more. This revised edition also includes updated information on recent human rights and war crime trials. The primary resources section contains documents that are vital to understanding this subject.